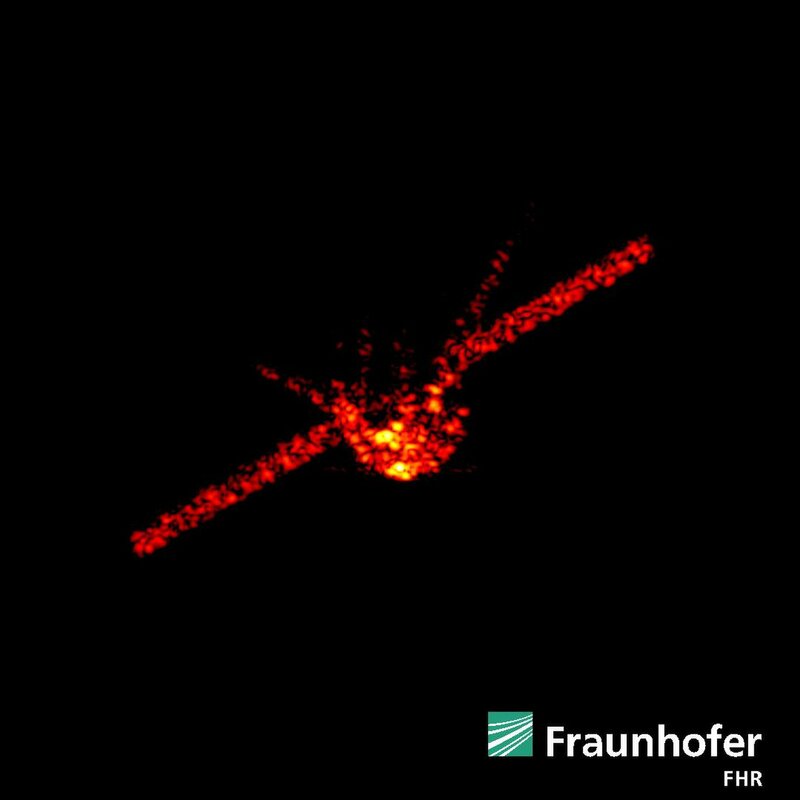 Detailed radar imaging of Tiangong-1; how do they do that? @JamesPoulose's answer shows an advanced radar image of Tiangong-1, 270 km from the Earth's surface. The images was sourced from Space.com's How Was China's Tiangong-1 Space Station Crash Tracked So Accurately?. If I estimate the spatial resolution at 27 cm and say it's 270 km away, that's 1E-06. If the wavelength were 1 mm, and assumed this image as from a straightforward interferometric array, that suggests a baseline of a kilometer. But I don't think that's how this image was made. 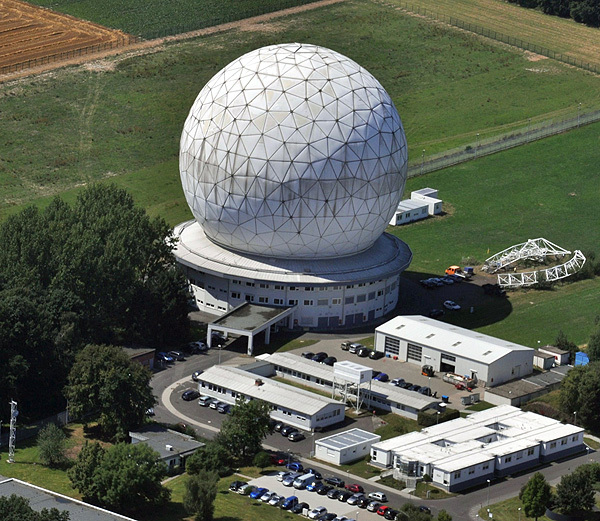 Question: Which radar system at the Fraunhofer FHR gets this kind of resolution at this distance? Did it require collecting data for minutes as the spacecraft passed overhead, sampling different orientations? Or just a few seconds? Was it all done from one fairly compact dish, or was a large physical baseline still involved? ...in Ku-band (16.7 GHz) and ... currently equipped with a high target resolution. The "ball" accommodates an antenna with a diameter of 34 meters. It can be turned 360° in azimuth (horizontal) and 90° in elevation (vertical). The movable part weighs 240 tons and can be turned at a speed of 24° per second (in azimuth), i.e. a full rotation takes 15 seconds. As the name implies, the TIRA system comprises a tracking radar and an imaging radar. The narrowband, fully coherent, high power tracking radar has a transmission frequency in L-band (1,333 GHz) and the wideband imaging radar has a transmission frequency in Ku-band (16.7 GHz) and is currently equipped with a high target resolution. I suspect that there'll be something more detailed about the technologies used in the Publications section of the FHR site, but couldn't find anything on the quick, and I lack the time right now to go through the complete lists for each year. There is an animation showing 3D rotation of the radar image in this Fraunhofer FHR tweet and a video of the dish in motion as well. Note the #radarlove hash tag. More on the TIRA System. ...the cross range resolution is provided by Doppler frequency analysis and is mainly determined by the processed synthetic aperture, i.e. the target aspect angle changes during the processing interval. For a square resolution cell of 25 x 25cm the necessary aperture angle is about 2.7°. In other words, the idea is that when you have a radar (as opposed to a passive radio observatory) capable of generating carefully controlled pulses, and when your receiver has sufficient bandwidth and sufficient spectral resolution, and when the target is moving across the line of sight, then you don't need a huge antenna baseline to attain high image resolution: The motion of the target is what provides the baseline. (Whence Inverse SAR). Not the answer you're looking for? Browse other questions tagged radar tiangong-1 synthetic-aperture-radar or ask your own question. Is there real footage of Tiangong 1 reentry? How does radar calibration using LEO orbited calibration spheres work? How can ICEYE-X1 capture 2D high resolution SAR images in “tens of seconds”? Where on Earth can one view the entry of tiangong-1?